Reintroduce flavor and texture to home cooking, from duck fat French fries to perfectly flaky lard pie crust, with this definitive reference for processing, preserving, and cooking with animal fats. 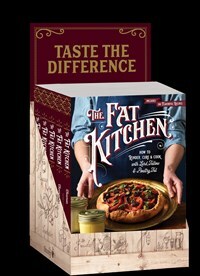 Andrea Chesman is the author of The Fat Kitchen as well as many other cookbooks that focus on traditional techniques and fresh-from-the-garden cooking. Her previous books include The Pickled Pantry, Serving Up the Harvest, 101 One-Dish Dinners, and The Backyard Homestead Book of Kitchen Know-How. She teaches and gives cooking demonstrations and classes across the United States. She lives in Ripton, Vermont. Michael Ruhlman is the author of The Elements of Cooking, The Soul of a Chef, and The Making of a Chef: Mastering Heat at the Culinary Institute of America, among others.